MEXICO CITY (Reuters) – Labour provisions in a new North American trade deal should be enforceable in Mexico, the head of the country’s Senate labour committee says, adding that lawmakers could pass new national labour rules in the next two months. The deal, known as USMCA, must be approved by the U.S. Congress and Canadian and Mexican legislators before becoming law. U.S. Democrat lawmakers may also push for making the deal’s labor rules, which include minimum wages for some auto production, enforceable. Gomez Urrutia said the current language of the text, which was signed by the presidents of the three countries on November 30th, made the labor chapter virtually voluntary. 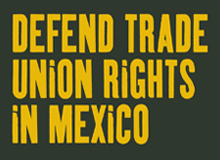 In the existing NAFTA, labor rules are not enforceable. “I have insisted in hearings with the negotiators of this free trade agreement that they make the chapter on labor right obligatory, that it is not a recommendation, because otherwise, there will not be a major change,” he said. The senator, a veteran of Mexico’s labor movement, also said the country’s new labor law, aimed at increasing union democracy and possibly making it harder for companies to “outsource” workers to third parties, could be passed in late February or March. Previously the new government of President Andres Manuel Lopez Obrador, which took office on December 1st, had aimed to pass the law by January. Gomez Urrutia, who also heads a miners union and is a member of the Senate’s mining committee, told Reuters that he would also push for tighter regulation of mining concessions and fewer restrictions on canceling them, as well as a review of mining taxes. Thanks to Ben Davis of the USW.